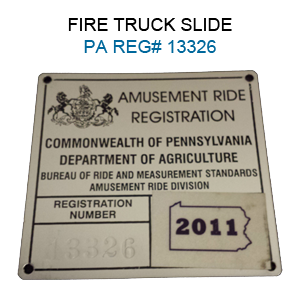 The Fire Truck Slide is licensed and registered in Pennsylvania. Please click here for pricing and availability. With the dimensions of a backyard slide, this unit makes a great item for fund raisers as well as rentals. Actual photographs of real fire trucks were used to create a digital image that looks like the real thing. Amazing photo-realism graphics are really on display with the most requested slides ever created. The fire truck side is the perfect way to combine fun and healthy activity, and will add value to any Party Rental! With a variety of colors, shapes and themes, our moonwalks offer kids of all ages exciting aerobic activity. Our moonwalks are made safe and secure with lite n strong™, fire-resistant vinyl making it safer, portable and more durable.